I thought it time you had a more recent report on this hotel, the major complaint is relative to being completely overrun with kids, in a non-school holiday period, mostly quite ill-behaved particularly in the dining room, where there was absolutely no dress standard for evening meal short shorts and vests order of the day. Food adequate for 3star,but this hotel should be marketed families only, couples take their chance, entertainment the normal crap, drinks were quite good, cleanliness excellent. This hotel does what it says on the tin! The rooms are really small apartments so extra facilities are in them like fridge,hob and dining table. Also the rooms have air-con and satellite T.v. The food is of a good quality however somewhat repetitive but you wont go hungry with snacks in between the meal times. The bar is a bit tired looking but does the job with a self service beer tap and soft drinks and staff always happy to help. The entertainment staff are ok they looked a bit bored at times but they seem to do there best they are employed by the hotel not Thomson so have to repeat everything in 3 or 4 languages as its a mixed nationality hotel,professional shows were only twice a week hopefully this would increase as the season goes on. The grounds and pool were kept very clean and tidy with staff cleaning all day plenty of loungers and space around what they say is the biggest pool on Menorca. It was about 1/3-1/2 full when we were there and that meant no queues in the dining hall, it was all buffet style and always piping hot. The salad selection was also fantastic. Once a week they have a celebration dinner(paella). The kids were a bit fussy about the food , but there was a pasta selection(and chips) if they didn't want to try anything else. There was a fish dish and at least 2 meat/poultry dishes to chose from examples of which are tuna, sardines, steak pie, pork, chicken, rabbit, duck etc. The menu repeats weekly. Snacks are available all day and included Ice cream, (so what if you had eat it in the resteraunt , it got us and the kids a break from the sun.) Afternoon snacks were best with Hamburgers, hotdogs and pizza. Try the cocktails, so refreshing! The entertainment staff were really good with the kids, (Gemma was great) don't expect too much for adults, but they try. They did bring in some good shows (Afican Footprint, Dreamfactory(disney songs)and flamenco dancers but I felt the entertainment finished too early most nights 10:30pm, however the bar stayed open til 12 on the dot. The location lets it down--- just a bit too quiet, 2 gift shops and a Spar get very familiar over a 2 week holiday. A plus is the harbour is very picturesque, and the bus to Mahon takes 10-15mins. 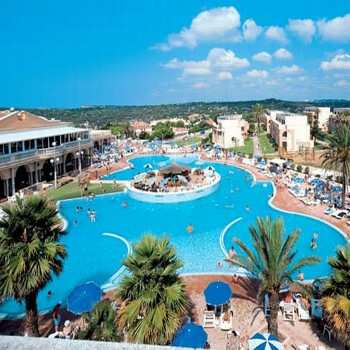 I would visit the hotel again, especially if I had small children to entertain-- kids club ran 6/7 days and the pool was absolutely fantasic--- with 2 play parcs and crazy golf, bouncy castle every night and a games room, they were kept happy. The teenager was our problem, not anything for them to do except use the internet connection at reception. lovely pool, very large , very clean. entertainment ok, but u hav to wait to hear 4 differant languages before u get to english, but they do try hard, went to water park , very log journey dont go if u get coach sick, they tell u its 45 mins more like 2 hours! water park ok ish, u hav to pay for chairs, and food not good . we all had upset stomachs the next day , location too remote . 2 shops one spar.one bar, chepos, not cheap and not good. good holiday if u just want the pool. beach awfull, very small,would never go again. This is the second time we have stayed at this hotel as, when we arrived home last year, we booked again three days later. The whole of the hotel was very clean, including the dining hall, grounds, pool area and apartments. The maids came nearly every day and cleaned where possible. This was not always easy as, with two young children, the apartment was full and sometimes messy.The food was good and there was something for everyone. I recommend that anyone who goes should eat the salad because otherwise they will return looking like a bloater!! I fully intended doing this but due to the choice, i ate as much as possible. The location is good and in a quiet area, which we knew, and this suited us as there was enough to do on site. You could laze all day or join in the daytime activities with the entertainment staff. There is Chepas bar at the side of the complex but i would not recommend it as the owners are miserable. I wanted to see the England/Germany game so went to a Restaurant bar, run by a local, near to the beach. This was much better as the staff were very friendly and the beer was much cheaper. The beach is small but the cove is excellent. I suggest buying a snorkel and swimming further out. The hotel staff were excellent and very friendly. The waiters were helpful and efficient and i also had a problem with the apartment electrics. This was fixed asap and with no fuss. The entertainment staff were very good and worked so hard throughout the day and night and made the games fun.Water polo is a must but take some bandages with you! Although i am staying in Menorca next year i will be at a different hotel but would certainly return to this one and i would also recommend it anyone, especially families. Please dont go if you wish to get embarassingly drunk and act like a British lager lout. YOU ARE NOT WELCOME! There is a good mix of nationalities, most people were very friendly. Finally i met a lot of friends there, some from last year and some new. You know who you are and you are a good set. See you soon. This was our second visit to this hotel and would return again in a few years after trying somewhere new. The hotel was vey clean as expected. Miriam our maid was fantastic, almost a magician! As the report says before this one( I think we actually met! we are the ones who went on the lazy day cruise-fantastic!) if you venture off the salads you gain weight simple!!! Oh and we did! The meals were fantatic as they were two years ago! One thing I would add though is on the 1st September all the kids junk food isle ended (so no more burgers, hot dogs pizza etc at every meal)! This did not bother us as even with a vegetarian 7 year old there was still plenty of choice and with microwaves a plenty its amazing what else you could create for the fussy eaters! I also noticed hand blenders for creating baby/toddler food! We have just returned from 2 fantastic weeks at Mar de Menorca. The hotel and grounds were immaculate and our room was cleaned 5 days out of 7 and each time the towels and bed linen were changed. Air conditioning would have been great but fans made the nights bearable (at an extra charge). The food had something for everyone. It was not repetitive and so varied that I had trouble choosing what to eat and often had a second plate (reason for half a stone weight gain!!). The waiters are very keen to clear your plates away so watch out if you've not finished but put down your fork! The staff are helpful and polite. The bar staff rarely have smiles but maybe they're not paid well! The miads are very nice. The reception staff are good too. The entertainment is basic hotel stuff but great fun. They speak in 3 or 4 different languages whilst doing each show so it can be a bit long winded but is obviously necessary. The entertainment staff worked really hard and made us all laugh day and night. The kids absolutely loved it. The location is very quiet and a bit remote but we were aware of this and were happy to be in a quiet, unspoilt resort. The beach/coves are small but very sweet and the water is crystal clear. There were jelly fish in the sea so beware! The pool is huge and clean. There was always a rush for sunbeds in the morning and although you're not supposed to do it, everyone reserved beds with their towels by 8.30 each morning. They don't mind kids using inflatables and there was always plenty of room even with loads of airbeds etc. 1) The water they offer is definitely not bottled mineral water. It is very salty and must be tap water - which is safe to drink but because of the different mineral content to our UK water it may upset your tummy. This makes it too much of a risk to drink - especially for kids - so we had to buy bottled water every day. I think that's a bit out of order when it's all inc. and we all know we should drink lots of water in the sun. 2)My other winge is that the All Inc bands are cut off your wrists when you check out at 12 noon on day of departure. We didn't leave until 4.30pm so it was a pain and considering we didn't arrive until after 7pm on our day of arrival they should have been happy to feed us until we left. Apparently your all inc runs from 12 noon on day of arrival to 12 noon on day of departure. I think this is madness as most people arrive and depart at roughly the same time, don't they?? We LOVED it,our moans are small ones and we would go back!! Hotel was kept really clean and tidy. Food was fine lots to choose from. Location is not that good.Nothing outside hotel apart from one bar and a spar shop and a gift shop. Beach very small and not very clean,but water is clean and clear. Hotel staff were great.any problems sorted straight away and all were polite and friendly. The entertainment was set up for the german holiday maker but if you have kids they will enjoy the mini disco and most of the entertainment. Entertainment staff gave there all and were great with the kids. This hotel is great for kids but if you are going on a adults only holiday I would go elsewhere. The Hotel is located in a lovely are of the Island, very peaceful, ideal for a getaway type holiday. The Hotel is large but you never seem to trip over anyone, always plenty of sun beds around the massive swimming pool which was always clean. The gardens are well kept with wonderful palm trees and other vibrant coloured plants and bushes. The rooms were always kept clean and ours had a lovely view, make sure yours is not located too close to the pool unless you want to be up early next day, bit too mush noise first thing. The food on the resort was reasonable for the price we paid, dont expect 5 Star. The drinks too were acceptable but you wont get brands you know. The entertainment was very well done, the young team did really well and the kids loved it. The hotel staff were not very friendly, only wanted to do the basic amount of work, would not go the extra mile. The only ones who worked there socks off were the cleaners.